Ireland’s banks will escape any fallout, but the State and private institutions will lose out if Greece goes to the wall. IRELAND WILL FACE a hit of just over €200m if the under-pressure Greek government is forced into a default – but our banks will escape any impact. Figures provided by the Central Bank show that while Irish lenders are not exposed to Greek debt, the public sector owns around €36 million of the country’s bonds. The majority of the impact from a Greek collapse would be felt in Ireland’s private sector, which has an estimated €165m exposure to Greece, according to the figures compiled at the end of March. Greek debt could potentially become entirely worthless if the country defaults, though a 100 per cent write-off would be almost unprecented. Instead, ratings agencies like Standard & Poor’s estimate that Greece could only pay out between 30 and 50 per cent of the stated value of those bonds. Ireland’s hit is modest in comparison to the hit that the UK could face, with British banks exposed to £366bn (€410bn) in Greek debt due to complicated derivatives and second-hand insurance deals. So while Ireland’s potential bill breaks down to around €43 per person, each person in the UK would face an average bill of around £5,900 (€6,600) if Greece hit the wall and failed to pay back any of its debts. A Greek default could be on the cards if the under-fire government of George Papandreou fails to win parliamentary approval for a new batch of austerity measures, thought to be worth up to €15bn. The latest tranche of the country’s bailout is due to be paid this month – but will be withheld if Greece cannot commit to further budget cutbacks. If the bailout funds aren’t handed over, Greece will have no choice but to start defaulting on its national debt. Opposition leaders in Greece have today vowed to fight any proposed cuts, in spite of Papandreou’s narrow victory in a motion of confidence last night. Email “Ireland faces €200m hit if Greek economy crumbles”. 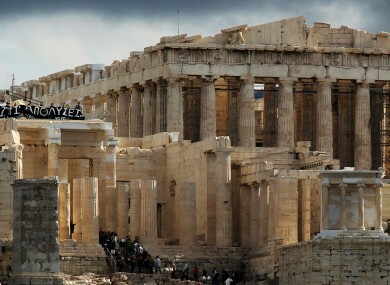 Feedback on “Ireland faces €200m hit if Greek economy crumbles”.